Adjustable height for originals up to 8″ thick. Artwork is scanned face up, with no direct contact during the scanning process. One of the goals at POV has always been to provide our clients with a wide range of materials and options, and to provide the best prints possible using the latest technology available. 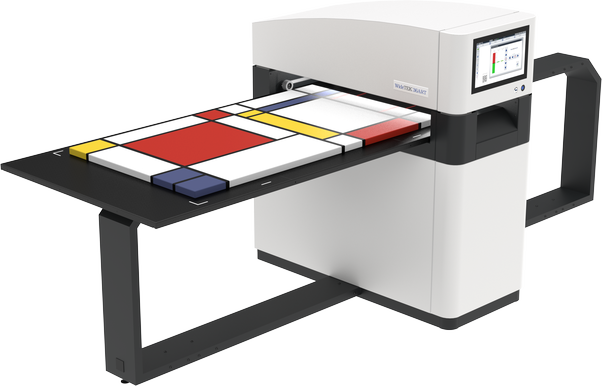 We’re continuing this pursuit by acquiring a new large format flatbed scanner that can accommodate original works of art and objects up to 36″ x 60″. This new scanner – a WideTek 36 Art Scanner – uses a laser system to adjust for fine focus and sharpness. The height of the optics are adjustable and provide vertical clearance for originals up to 8″ thick. Paintings and collages with up to 3″ variance in surface height can be effectively scanned with all levels of the surface being crisp and in focus. This new large format scanner will streamline our fine art scanning and – in many cases – allow us to skip the step of having to stitch together multiple files when scanning your artwork.